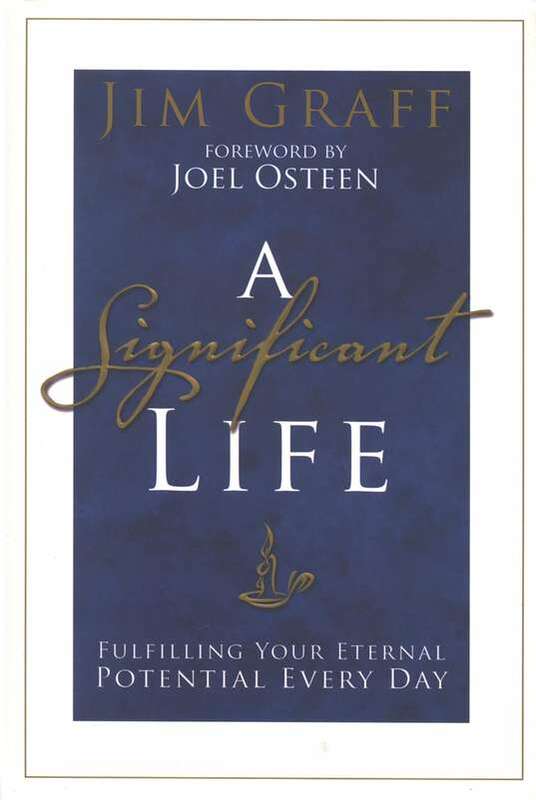 The following is a report on the practical applications of Pastor Jim Graff's new book, A Significant Life: Fulfilling Your Eternal Potential Every Day, (Waterbrook Press, 2006). You wake up every day, try to enjoy yourself, and do your best to fulfill responsibilities. But do you ever wonder whether or not your life really matters? It does to God. And if you embrace His unique purpose for you, you can live a truly significant life – one that makes an eternal difference in the world. Develop the confidence to dream. Don’t be afraid to dream both small and large dreams. Ask God to help you distinguish between your own desires, and His desires for you. Be willing to sacrifice your dreams that don’t align with God’s will, and embrace His dreams for your life, trusting that He knows what’s ultimately best for you and remembering that He can do more for you than you can even imagine. When you sense God calling you to act upon a dream, go for it! Rely on the power He’ll give you through the Holy Spirit. Let go of past failures and disappointments so you can move into future opportunities. Learn from your mistakes and be open to new dreams. Persevere in the process of turning dreams into realities. Remember that God will complete the good work He has started in you. Focus on God’s promises instead of your problems. Look beyond your own limitations to God’s unlimited power. Don’t wait until you feel like you’ve got it all together to pursue a dream; just start pursuing it, knowing that God will be with you every step of the way. Recognize that God often uses ordinary people to accomplish extraordinary dreams. Build the confidence to grow. Whenever you encounter difficulties, remember that your faith will be strengthened if you choose to trust God to handle each difficult situation. Know that doing so will lead to greater maturity and more confidence in God. Remind yourself of times when God has helped you in the past, and believe that He will continue to help you in all the ways you need His caring touch. Understand that you can experience a significant life throughout your journey – not just from reaching one particular destination. Give God your best in everything you do, knowing that if you serve faithfully in small matters, He will entrust you with larger tasks and more responsibility. Rather than letting fear or uncertainty immobilize you, decide to praise God for the way your situation can bring you new opportunities to trust him more fully and grow in confidence. Ask God to ignite fresh passion in you to make progress toward becoming the person He wants you to become. Exercise your faith when you can’t tell what God is up to, trusting that He is using your circumstances to transform you. Develop the confidence to endure. Respond to rejection by learning whatever you can from it, but moving on. Never let rejection discourage you or cause you to quit. Ask God to give you the courage to choose to confidently follow His leading even when circumstances look bleak. Be on guard against discontent, discouragement, and depression. Whenever you confront them, pray for God to give you His perspective on the situation. Remind yourself often of the truth that God will do something special with your life if you will exercise faith in living out your purpose, no matter what. Build strong character. Whenever you’re tempted to handle a situation your own way instead of God’s way, remember that: other people will be affected by your decision, some people will choose to follow your example, and God has a will concerning your actions. Ask God to strengthen your character so you can think and act wisely at all times, including when no one else is watching you. Decide that you will express God’s love to others – even to those who have hurt you – in all situations. Be willing to forgive. Live with integrity in all areas of your life so people will know they can trust you. Keep others in mind. Seek to inspire and motivate people to live righteously themselves when they see your example. Consider what people will likely remember about you after you die. Keep your legacy in mind as you make daily decisions, recognizing that small choices now actually have big significance in the long run. Show people that you are willing to do the right thing even when it’s unpopular or difficult. Embrace what’s right even when the situation seems to indicate that your actions won’t matter. Surround yourself with friends of good character, realizing that they will influence you just as you will influence them. Make them your allies. Encourage each other, support each other, and hold each other accountable. Do your best to solve problems that matter to others; in the process, you’ll create partners who will also want to help create a better world. Join others in service work and work in teams, knowing that you can often accomplish more together than you would alone. Don’t get sidetracked from God’s will. Understand that it doesn’t pay to pursue success at the expense of your own significance. Make choices that reflect where God is truly leading you rather than just your personal agenda. Stay connected to God through frequent prayer, asking Him to keep guiding you and helping you stay in His will for your life. Check your motives. Take time to consider your motives before making decisions. Ask God to give you the strength each day to avoid selfish motives and refuse to compromise holiness. Think about whether or not the choices you’re considering will actually produce the circumstances you desire. Think from a long-term perspective rather than just a short-term view. Recognize that God’s rules are to bless you and save you grief, not to stifle you. Remember that, while your plans may not always work out, God’s good plans for you will work out. Persevere through pain and trust that your circumstances will eventually reflect God’s grace if you make the right choices. Don’t cave into the temptation to pursue more pleasant options when obeying God will bring you pressure. Know that obedience is always worthwhile. Keep going. Don’t give up when facing challenges; remember that your course is not too difficult, because God is traveling with you. Know that He will never let you down or push you past your limit. Pray for the strength to carry on. Understand that God will provide everything you need to overcome the obstacles you encounter. Remember God’s promises from Scripture and draw strength from them. Concentrate on doing God’s will, no matter what circumstances you must confront. Remember that obedience brings rewards rather than regrets. Cooperate with God. Stay strong during the tug of war between encouragement and discouragement in your life, remembering that God is on your side. During seasons when it your efforts to follow God’s call are yielding little return or cynics say your efforts are worthwhile, plug on. Remember that God never promised it would be easy, but He did promise to be with you through it. Stay on course during hard times as well as good times. Keep pursuing God’s will even when it conflicts with other people’s wills. Keep on living faithfully, trusting that your consistent obedience will eventually lead to the significant life God wants for you. Ask God for the strength you need each day to endure whatever you need to endure to see His vision for your life become a reality. Adapt to detours. When you encounter surprising turns on life’s road and feel lost, don’t despair. Instead, trust God to guide you through. View surprises as gifts that can teach you valuable lessons about how God wants you to grow. Don’t give into momentary frustrations; instead, decide to obey God as He leads you to places you could never go alone. Be willing to wait when you sense God leading you to do so, rather than striking out on your own without clear direction. Pray daily for God to guide your path and align your steps with His will for you. Expect to sometimes be persecuted for serving God. Whenever that happens, fight against discouragement by praying often, reading the Bible often, and spending time in fellowship with other believers. Be prepared for the possibility that God will sometimes choose to use you in ways you don’t expect or even desire to serve. Be willing to serve in any way He leads you to serve. Ask Him to give you the humility you need to do so. Instead of focusing on what you don’t have and feeling pity, focus on the joy you have in knowing God. Praise Him for who He is and for loving you. Remember that He often designs detours to propel you into a more significant life. Make yourself accountable. Build close relationships with at least a few people you trust who will hold you accountable for your thoughts and actions on a regular basis. Let those accountability checks support and encourage you to live as faithfully as you can. Whenever you do make mistakes, confess, repent, and accept God’s forgiveness and grace to do better. Don’t lose hope; remember that God can transform even the worst mistakes into catalysts for His kingdom work. Know that you can rest in His love no matter what you’ve done and move into a destiny that He has already redeemed through His sacrifice on the cross. Don’t harbor secret sins. Give every area of your life to God each day, knowing that if you cooperate with Him, He will bless your life with true significance. Share your life with others. Recognize the fact that your life can’t be truly significant unless you share it with others. Don’t isolate yourself. Stop being too busy to build close relationships; slow down enough to make relationships a top priority. Come clean with God and with others by not hiding anything and being willing to be honest and open. Rather than focusing on what other people can do for you, focus on what you can do for them. Use your natural talents and spiritual gifts to the fullest by contributing to your community. Understand that investing in others is essential to living a significant life. Let your relationships help you grow. Know that the more you interact with others, the more you can develop a significant life. Prioritize your community commitments. Communicate with compassion and learn how to deal with conflict wisely and extend healthy accountability. Pursue forgiveness and grace. Persevere through the tough times, remaining committed to your relationships. Bear each other’s burdens during struggles and celebrate good times together. Be assured that your life will take on great significance during the daily process of interacting with other people. Adapted from A Significant Life: Fulfilling Your Eternal Potential Every Day, copyright 2006 by Jim Graff. Published by WaterBrook Press (a division of Random House, Inc.), Colorado Springs, Co., www.randomhouse.com/waterbrook/. Jim Graff is the pastor of Faith Family Church in Victoria, Texas. Under Graff’s leadership, Faith Family Church has grown from 300 to 4,000 active members in a city of only 60,000. Jim’s passion for small communities in America has led him to launch the Significant Church Network, designed to establish significant, thriving church communities throughout the smallest and most overlooked counties in the nation. Jim is married to Tamara, who is also a pastor at Faith Family Church. Together they have four children - Michael, Andrea, Emily, and Geoffrey.